You can get full and unlimited access to the most widespread file systems in the World on your Smartphone! Easily copy, transfer and modify data on NTFS volumes alongside with HFS+ ones. Forget about incompatibility issues between your mobile handheld and its big brothers – PC and Mac. Attach to your device any flash drives, hard disk divers and other media with NTFS and HFS file systems and work with them as if there have simple FAT32 one. Root access is required. To verify root access please use Root Checker app. The only cross-platform tool on the market with NTFS and HFS+ partition automounting feature! 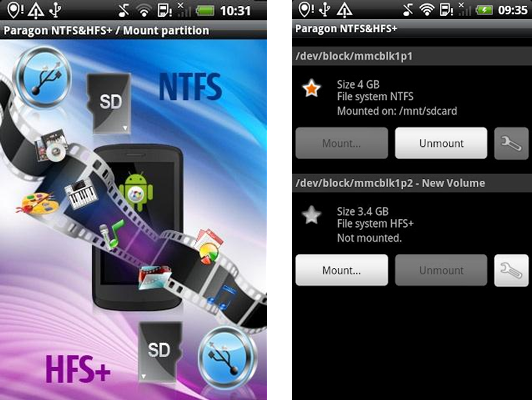 The new automount option, which can be conveniently activated or disabled in “Settings,” allows users to mount all NTFS and HFS+ partitions automatically when an SD card or a USB flash card is connected or upon booting the Android-based device. Full high-performance access to volumes of the most popular file systems (NTFS, HFS+) under Android OS where these file systems are normally not supported. 18 years of industry expertise you can trust. Successfully tested by nearly 50,000 Android enthusiast! The software is now available from Google Play. The software is free and you can get free lifetime upgrades by registering in the following webpage with your name and a valid email address. When registration is completed, you will receive an email from eservice@paragon-software.com with your product registration information and login information for your account at Paragon Software. 1. Login to your account: https://www.paragon-software.com/my-account/ with the login information sent via that email. 2. Go to “Products” / “View registered products”. 3. Find NTFS & HFS+ for Android in the list and click “Download” in the “Update” column. This entry was posted in Android, File Management, Free, Macintosh, Software, Windows.